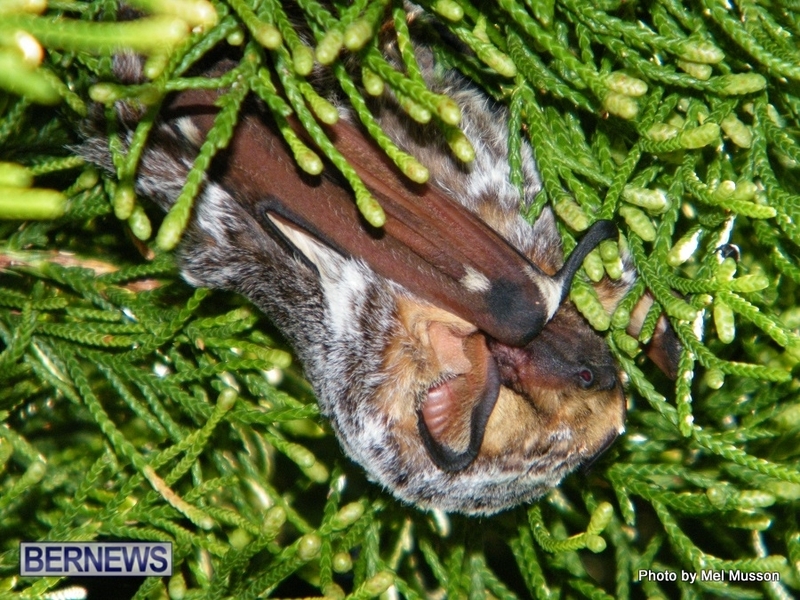 A bat, identified as a “Hoary Bat”, was spotted sleeping in a tree in Sandys yesterday morning [Dec 1]. Dr David Wingate said this is the largest of four species of highly migratory bats of eastern north America which are migratory by virtue of their tree roosting — as opposed to cave hibernating habit — thus forcing them to fly south for the winter. Dr Wingate said it during their migrations that they regularly get blown off course out to Bermuda in storms. “All four species occur regularly in small numbers in both fall and spring and there are, in fact, records for every month of the year because they often try to winter over. They are best looked for at early dusk over open fields or marshes in sheltered inland valleys such as Devonshire Marsh,” said Dr Wingate. @Alyssa, they’re more like mice with wings! More like wings attached to AWESOME! I’m guessing you’re joking & now that a bat is a mammal not a bird. Right? If I let it bite me will I gain super powers or does that only apply for spiders? Just askin’…..
You will turn into Batman Johnboy! Let it bite you? The only thing you’ll end up with is a deadly case of rabies so don’t be so silly. I hope TPTB have this thing destroyed. We don’t know what it’s carrying. Bermuda is now rabies-free but all we need is for this thing to bite a pet and we have a problem on our hands-rabies in Bermuda. This is no laughing matter and it is not a case of being an alarmist. Bats are not ‘awesome’-they harbour disease. It needs to be destroyed immediately. Just read somewhere that in North America about 6 percent of bats actually have rabies. The human fatality rate after being bitten by a bat, however, is 100 percent! While we don’t know if this bat is indeed rabid, you are correct in that it should not be handled. Oh well, there go my plans for becoming Bermuda’s Dark Knight. Maybe I’ll just stick with spiders then! Chillax Annie, theres more chances of catching rabies from rat bites or diseases from roaches & we all know how many thousands of them dwell here. I don’t think a bat could make it this far from home if it was sick. I know some who used to catch bats as kids & they’ve been bitten loads of times but never caught anything. Although for a bit after a bite my buddies couldn’t see their reflection in the mirror & would order their burgers medium rare. Hope this flying furball eats every roach that crosses its path & survives the winter. Bats are cool roaches are NAAASTY!